As can be imagined, the discussions during the Constitutional Convention were complex and drawn out. What is interesting however is what happened after the Constitution was written. At this point, it was nothing more than a piece of paper. The Constitution now needed to be ratified by the states. So where did each group focus their efforts? 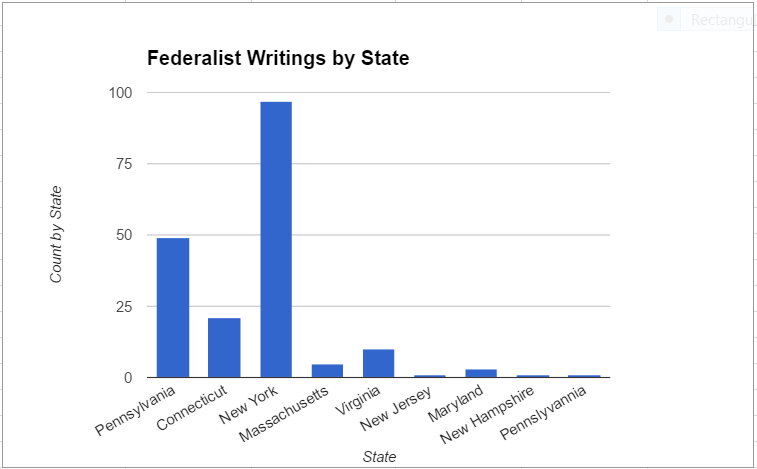 From the following graph, we can see the Federalists focused heavily on New York and Pennsylvania, followed next by Connecticut, Massachusetts and Virginia. From the map on the previous page, it made sense to focus so heavily on New York since it was almost categorically opposed to ratification of the new Constitution. 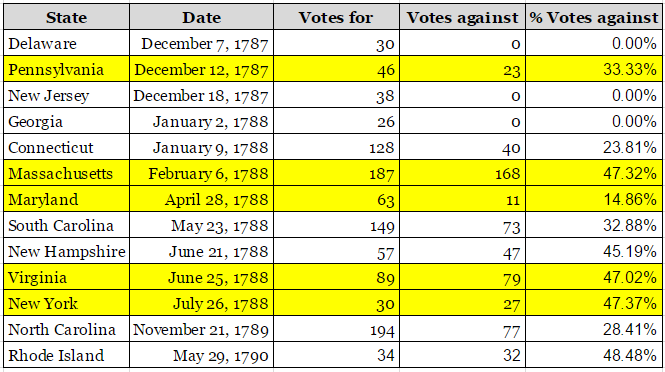 Looking at the chart of ratification dates, this effort was rewarded, if only barely. New York was one of the last states to ratify the Constitution and it did so by only a narrow vote. Although Pennsylvania ratified early, it also seems to have required the effort put into it. By the map, it was a state evenly split on its views and although they voted to ratify, there was quite a large (33%) faction of delegates opposed. Virginia also makes sense for a heavy focus. They are largely opposed to ratification, ratify late and also by a near even split in votes. The one that seems strange is Connecticut. Connecticut was largely in favor of ratification, ratified early and by a large margin. Similar to the Federalists, the Anti-Federalists focused heavily on New York and Pennsylvania. The relative effort would indicate they thought New York was important, but that Pennsylvania needed more attention. Maryland is also an obvious choice as it is mostly pro-ratification. Massachusetts at first seems an odd choice until Maine, at that time part of Massachusetts, is considered. Additionally, Massachusetts has the largest number of delegates. Virginia seems an odd choice a t first because it is mostly against ratification. On the other hand, they did eventually ratify, so in that sense, it was not actually enough effort. 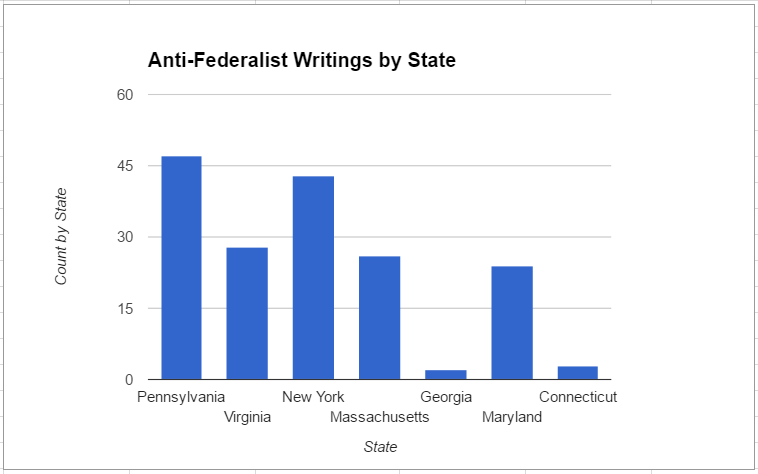 As mentioned above, it seems strange the Federalists put so much effort into Connecticut and the Anti-Federalists put so little. It is almost as if Connecticut was completely misread by each side. Common ground seems to be New York, Pennsylvania and Virginia. These three states are where the bulk of rhetoric was on both sides of the debate. Looking next at writings by month the first item standing out is the hug e upsurge in effort for January of 1788. Referencing the ratification chart above as well as the writings by state, this would seem to correspond with an effort in Massachusetts and Maryland. 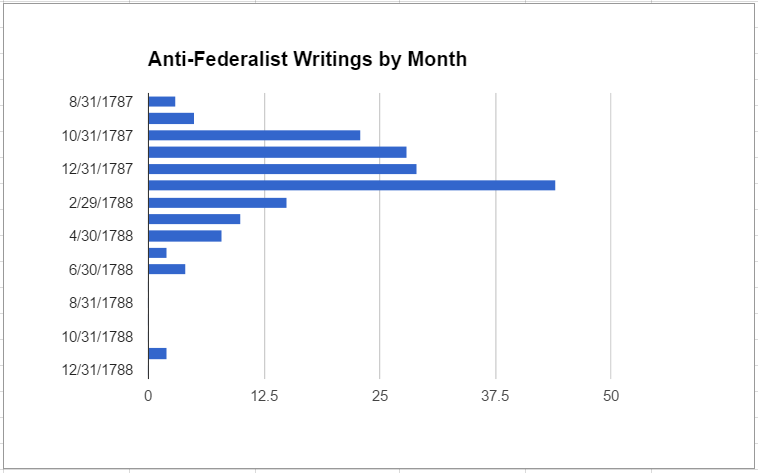 In fact, about half of the Anti-Federalist letters written then were focused on these two states. What is interesting to note about both of these graphs is they very closely mirror each other. They show something of a bell curve from August of 1787 to June of 1788. June of 1788 is when Virginia ratified the Constitution. At that point, New York seems to be the last, significant state. Ironically, the Anti-Federalists seem to have given in at this point and mostly stop publishing. The Federalists on the other hand kept at it. 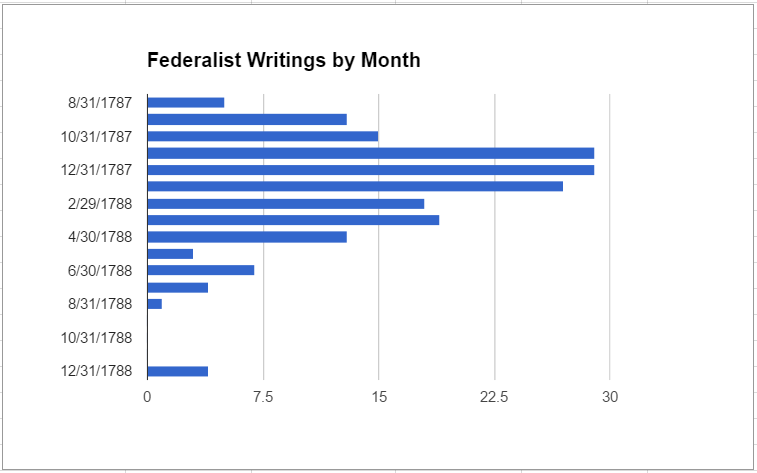 In fact, from mid-June, to mid-August, all but one of the Federalist letters are focused on New York. The final oddity in all of this is Rhode Island. 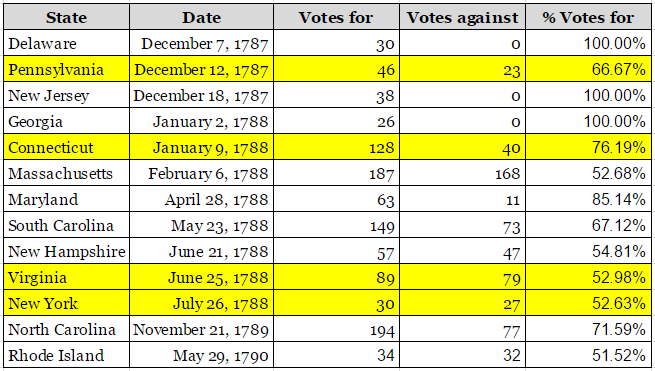 Rhode Island elected not to send delegates to the Constitutional Convention and was the last to ratify the Constitution by six months. Not a single letter tracked as part of this debate was addressed to Rhode Island. It would seem Rhode Island had no interest in the proceedings and the rest of the nation was content to ignore them.